I like to use hand-drawn elements in some of my conference presentations. In the examples below, I combined hand-drawn shapes and characters with a hand-written font to give it more of an organic look. What I like about this approach is that it is less formal than if all of the shapes and images were created in PowerPoint. I think it makes the presentation seem less stuffy. 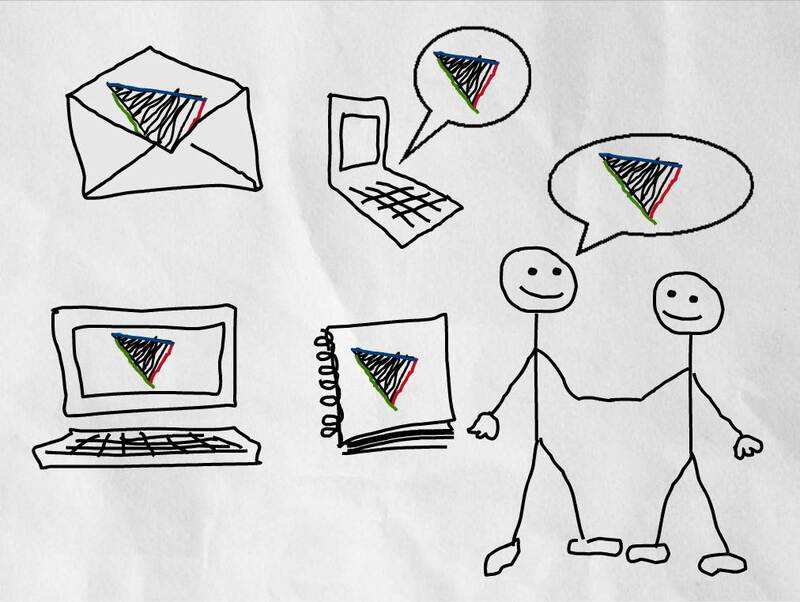 Hand-drawn objects work well in elearning, too. I discussed the value of hand-drawn elements in this post on adding personality to your elearning courses. I like that it adds some novelty, feels personal, and creates good contrast. We used them in the image below to draw attention to the navigation controls. I get a lot of questions about how to create them. Here are a few ideas. Take out a piece of paper and draw what you want. Then put it in a scanner to make a digital copy. At that point you can take the scanned image into a graphics editor and convert it to a usable image. If you feel like you have no drawing skills then at least try tracing something. Take pictures of people and then trace them on the paper. You don’t need all of the details to create some simple line drawings. Both Windows Vista and 7 are pen-capable so you can use your computer to create the drawings. I happen to have a tablet pc, so I can draw right onto my PowerPoint slides. When I’m done, I right click and save as a .PNG image file. 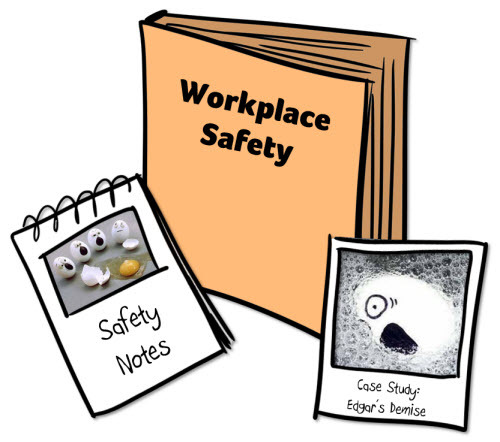 The example image below was created in PowerPoint using a hand-drawn frame and arrow. You can also use a Wacom tablet to do the same. In fact, the Wacom tablets are coming down in price and might be worth looking at if you have some drawing skills and figure you’d use it regularly. They definitely add a lot of value if you have to create your own graphics. You can also get an older used tablet pc on eBay for a decent price. That’s a good way to go and you get a larger screen than the Wacom’s. 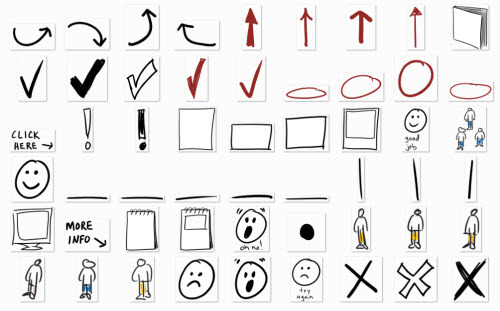 Anyone can learn to communicate ideas with hand-drawn elements. It’s less about the drawing and more about knowing how the drawing communicates. If you look at the community characters, they’re not perfect. But together they work. A great resource for learning about visual communication is Dan Roam’s Back of the Napkin book. You’ll learn how to communicate your ideas. Even if you don’t do any hand-drawing in your courses, many of the ideas that Roam shares are applicable to instructional design and elearning. To help you get started, I created some hand-drawn shapes and elements that you can use in your elearning courses. The example above comes from a few of the free hand-drawn objects. Download the hand-drawn objects here. Feel free to use them as you wish. Many of you out there also have tablets and are better artists that I am. If you’re interested in creating some hand-drawn shapes and images to share with the community, let me know. Tom, I’d vote for you even if you didn’t give us free stuff! I’m fairly new to elearning – less than a year. I’ve signed up for everything I can get my hands on. I just wanted to tell you that your blog is FAR AND AWAY better than the others. I actively watch my inbox for the next issue of RapidLearning. There’s something incredibly practical in every single issue. Your generosity in sharing what you know and do is completely without comparison in the industry. Thank you! all of your posts I enjoy reading. Honestly though most of them I find myself thinking…how can I use this? Why is that, you ask? Because I don’t have the software or the tools you do most of the time. I have Windows XP and 2003 versions of everything in Microsoft products. What can I do with these products to create hand drawings like you’re discussing above? Thanks for whatever insight you can provide. Tom, you got my vote, hands down! @Tim: with what you have, you can’t create the hand drawings (unless you have a tablet pc). But you sure can use the free ones provided in the post. In addition, you can still do most of the illustrations that I show in the blog and save them as images. Am always grateful for the freebies, which are useful and witty, and will vote for you anytime. That said, I know you mean them to be generic, but the peeps all pretty much read as male. Got any similar gals in your scribble archive? Tom you got my vote hands down or is that thumbs up. Thanks for a great post, Tom. My company created our sales training intellectual property based on neuroscience and simplicity. Because of this, we use hand drawn graphics/fonts in all our eLearning courses, marketing collateral, and presentation material. It’s at the core of what we teach. Dan Roam has been one of our inspirations. However, I must respectfully disagree with your comment about not being able to do this without a tablet pc. @Tim: we create almost all of our stick figure characters and simple hand drawn graphics right in PowerPoint using the scribble shape tool. It’s not the most sophisticated way of doing it, but that’s sort of the point. Here are two examples of hand-drawn images using the scribble tool. You’d be amazed at how much you can trace on-screen. 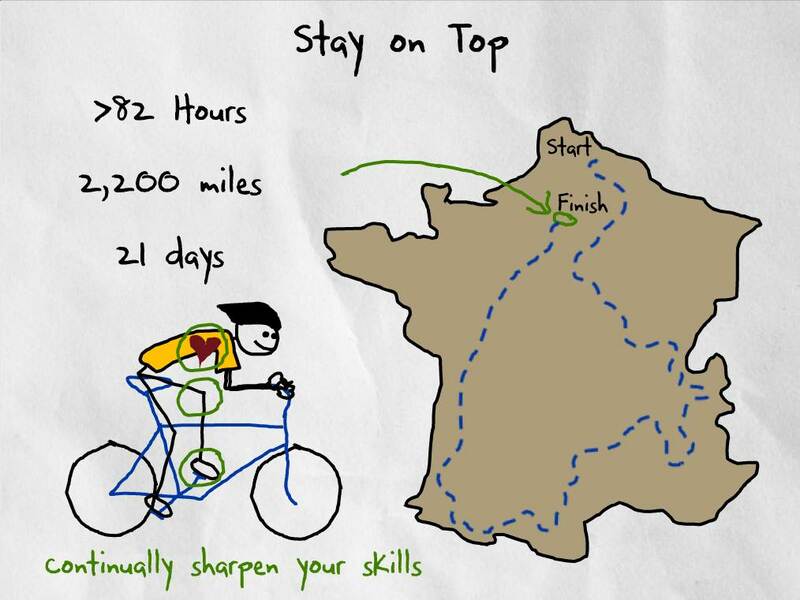 For example, for the graphic of France, I threw a real map image onto the slide and then used the scribble tool to outline it. Then I deleted the graphic behind it. Simple and no fancy equipment required. @Carol: the ones in yellow are female, they’re just wearing baggy clothes and have their hair pulled back (you can’t see the pony tails, though). Tom, really enjoy the usefull tidbits. 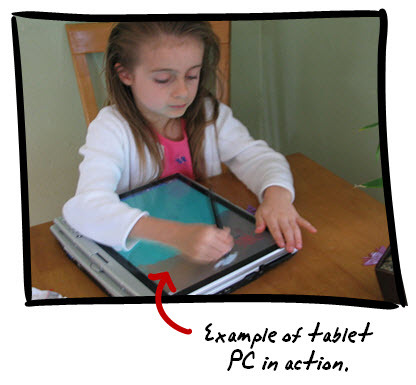 One thing that jumped out at me, and maybe I am having a brain freeze day, when I saw the hand-drawn pic of the girl and the tablet PC I wondered, how did he get a skewed photo to fit the frame? Or did he free-hand crop the photo and then draw the frame? I, too, have limited resources as one of the other posters noted, although I have more updated software. Working in a grant-based, government Division means I have to make the most of what I have. @Nicci: good tip on the scribble tool. You don’t get the smooth lines, but your images show that you can use it effectively. Tom, sadly, our State security blocks me from going to screenr. Thanks anyway. For every type of site that I need to go to or resource that has been deemed, for one reason or another, as a secutity risk or bandwidth hog, I would have to fill out a separate waiver form. @Steven: basically you just trace the frame with the freeform tool. Then fill it with an image. Make sure you subscribe to Tom’s blog via your home computer. I’m sure your schedule is a busy one. However, the Screenr tutorials are 5 minutes or under. You can look at them at home. I know that’s an obvious suggestion, but it helps when one’s workplace firewall is protecting confidential data. @tom Honestly, I don’t think anyone in the e-learning world provides as many resources and suggestions for the non-profit and educational sectors as you do. Kudos for “being there” for entities with limited (or no) budgets! I love your blog! It is the only one I read and save so I can go back again and again for new projects. Thanks Tom. Thanks for the freebies and all your great tips. I went right away to vote for your blog because quite honestly you’ve been an inspiration, and I can’t wait each week to see what you’ve got to say. My vote goes to you. I keep waiting for your post every week. Thanks so much. @all: thanks for the vote of confidence and the encouraging words. I voted too… Thanks Tom, you deserve that award. As always, a really BIG thank you for once again being so generous in sharing your resources. 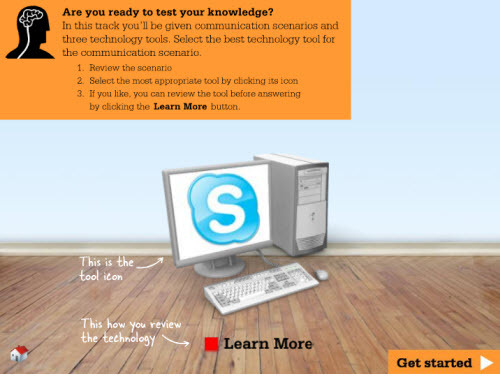 I really like the ‘wooden floor’ background in the ‘are you ready to test your knowledge’ screen that is shown above. Any chance you could offer some guidance as to how to locate/create this particular background? Just voted for you! And you were right – there are some blogs/resources that I learned about just from voting. Best of luck. You ROCK! I am amazed each day at how much I’ve learned about Powerpoint from your blog postings and tutorials, and now with all of the templates and graphics my work looks so professional! Again, thanks! Thanks for the great article! I’ve often thought that I’d like to get something hand-drawn looking, but never put the brain-power in to figuring it out. One item I’ve had a difficult time finding is the text – where did you get your font and what is it called? @Amy: one of the fonts is Skippy Sharp. It’s a for-pay font. However, I did a post a while back where I gave away a few hand written fonts. In addition, I got some from some community members which I’ll pack up to go soon. Hope we can help you win! I’ve tried several times over the last few days to download the hand drawn files and have been unable to open. Is the link possibly corrupt? @Tanya: the links work. It’s possible that your settings are blocking them. Try directly from the web site. just voted, I enjoy your blog and look forward to reading it everytime. you deserve to win this award hands down. 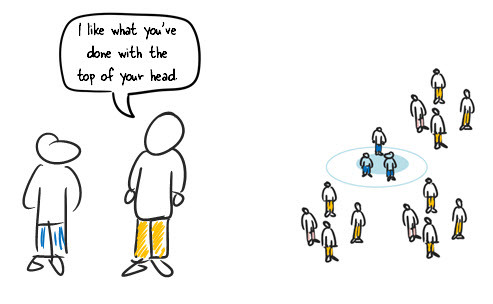 Do cartoon-like illustrations improve learning? thanks for your blog on hand drawn comments. I find alot of your blogs interesting and valuable, however because I work for a corporate organisation we are heavily restricted by guidelines that prevent us from using clipart and only use certain types of images. How do you find the balance between adding character to your blogs while still remaining a professional look? @Daniela: haven’t seen any studies, but I would say contrasting images/content do support elements of instructional design. It’s really all about context. Eye tracking on random web sites for a study is different than an elearning course. For example, if you progressively revealed images, my guess is that each time they animated onto the screen, the eye would move there. So it’s less about the graphic and more about how the graphic is used. @Jo: I see my job as one where I throw out ideas. Some work, some don’t. Many people have the same restrictions you do. 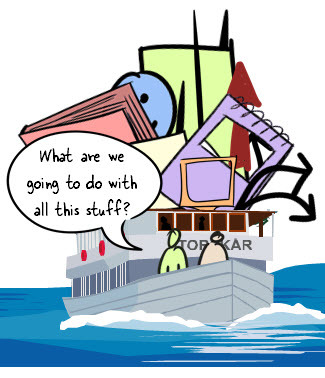 One of the problems with clip art for organizations is that many times how they’re used is bad. So the orgs want to control the quality. I have added your images to my ppt clipart library so they are easily accessible when I’m powerpointing. Thank you for sharing! Congratulations on your winning! SOOOOO well deserved! Congrats on the award Tom!! Well deserved, your blog rokks!!! THANKS soooo much for the hand-drawn graphics! I had fun using them to create a [half-animated] slideshow story! It’s amazing how one can do so much with just a few basic shapes and icons! I’m sure I’ve seen a post on creating the room graphic (the third graphic in this post), but for the life of me, I can’t find it again. Could you point me in the right direction?